Playwright Ayad Akhtar is unafraid to explore moral ambiguities which challenge our assumptions. Akhtar understands the difficulty of identifying “good guys” and “bad guys” in the complex situation that prevails, and, with “The Invisible Hand,” he has created a scenario of exceptional moral ambiguity, forcing the audience to think carefully about the complexity of American involvement in these faraway lands. 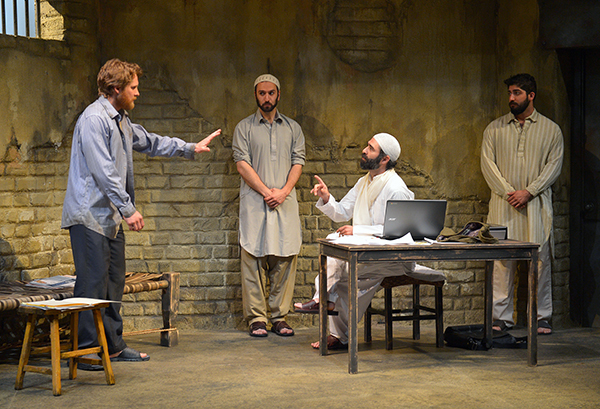 From L to R: Craig Marker, Pomme Koch, Barzin Akhavan, and Jason Kapoor in the Bay area premiere of “The Invisible Hand” by Ayad Akhtar at Marin Theatre Company. Photo Credit: Kevin Berne. At the start of “The Invisible Hand,” there is little difficulty in identifying the hero and good guy of the plot. Nick Bright (Craig Marker) appears to be an innocent man, kidnapped by terrorists and held for a ten million dollar ransom. He is not a spy or a soldier, or even a journalist. He is a relatively unimportant businessman who happens to work for a wealthy bank. He has excellent upper class manners, all-American good looks, an ivy league education, and a two year old son back in America who misses his Daddy. His captors are obviously brutal terrorists, the sort we know about, the sort that cut off the heads of innocent men to make a point. The suspenseful premise of this thriller is clear: will the American good guy escape the Islamic terrorist bad guys? We know this territory; we’ve seen it on TV and at the movies, over and over again. We can expect to be thoroughly excited and entertained, so long as we accept everything at face value and simply enjoy the action. Well, it isn’t long before playwright Akhtar starts messing with audience expectations. Nick’s jailor, Bashir (Pomme Koch) is a Muslim of Pakistani descent, but he is also an Englishman who grew up in London and speaks with a London accent. He is smart and sophisticated, capable of brutality, certainly, but also capable of reason and able to defend his actions as being in the interest of his homeland. He makes a strong case, too, to suggest that Nick is not the innocent bystander in Pakistan’s troubles that he claims to be. The play takes an unexpected twist when the bank which has been negotiating for Bright’s release cuts off all communications. Bright is on his own, and the possibility of his death, perhaps by beheading, becomes more urgent. 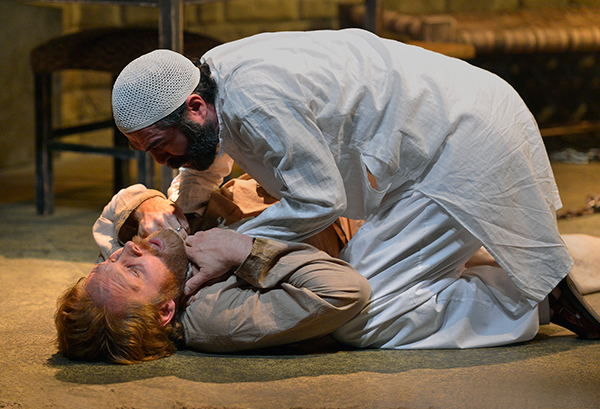 Imam Saleem (Barzan Akhavan) lashes out at Nick Bright (Craig Marker) when he thinks he has been tricked. Photo Credit: Kevin Berne. Desperate to save himself, he offers a startling proposition. As a banker, he can perhaps play the markets to raise ten million dollars himself, provided he gains access to his personal bank accounts as starting capital. He will also need access to financial news and assistance in setting up a traderoom, to be provided by Bashir, whom Bright will undertake to educate in money management. An agreement is reached; Bright is given one year to raise the ten million dollars to earn his release and save his life, and the suspense clock starts in earnest. This unexpected setup allows the play to take off in surprising directions. We are given a fascinating education in money markets, and the history of the dollar in Pakistan. We learn about shorts and puts, and how the local economy has been affected, and lives impacted, by foreign bankers. We come to understand something of the ambivalence that Bashir feels towards the likes of Osama Bin Laden. We encounter the characters of Imam Saleem (Barzin Akhavan), a charismatic leader who is cloaked in mystery, and Dar (Jason Kapoor), a young man caught up in a whirlpool of conflicting loyalties. And through it all, the clock keeps ticking. “The Invisible Hand” is a thriller plus. It has all the requisite excitement and suspense, but is enriched by moral ambiguities, interesting characters, fascinating details about financial markets, and more. This is an ambitious play, ambitiously and skillfully staged by Director Jason Minadakis with the help of excellent designers. All of the cast is outstanding, but Craig Marker deserves to be singled out for this superb demonstration of versatility after starring in the Marin Theatre Company’s previous show, “Ann Boleyn,” as both King Henry VIII and James I. He is an actor who clearly grows with each project he undertakes. “The Invisible Hand” continues at Marin Theatre Company through June 26, 2016. For further information click here. “The Invisible Hand” by Ayad Akhtar, regional premiere produced by Marin Theatre Company. Director: Jason Minadakis. Scenic Designer: Kat Conley. Costume Designer: Callie Floor. Lighting Designer: York Kennedy. Sound Designer: Chris Houston. Properties Artisan: Lizabeth Stanley. Dar: Jason Kapoor. Nick Bright: Craig Marker. Bashir: Pomme Koch. Imam Saleem: Barzin Akhavan. Posted in Reviews.Tagged Ayad Akhtar, Barzin Akhavan, Callie Floor, Charles Kruger, Chris Houston, Craig Marker, Jason Kapoor, Jason Minadakis, Kat Conley, Lizabeth Stanley, Marin Theatre Company, Pomme Koch, san francisco bay area theatre reviews, The Invisible Hand, theatrestorm, York Kennedy.